Over 600 stone steps shimmer silver under a full moon. Any less light, a night pilgrimage would be suicide ascending this steep splinter of rock rising from the sea. My breath races as my boots seek safe purchase. High above, torches cast golden globes of illumination from the medieval church where twelve shaved and hooded monks are dressed in rough homespun. They sing the Gregorian chant; their voices weaving an invisible Celtic design through the air, forming a veil of peace. Upwards I climb towards Christ’s Saddle, a strip of land between two 714’ peaks. With God’s grace, I’ll arrive safe. I imagine this is what it was like long ago on the holy island of Skellig Michael. Coptic monks from Egypt built the six dry stone beehive cells and two oratories as early as the 6th century. Details are murky, but St. Fionan might have had a hand in the establishment of this and eight other monastic islands nearby. One thing is certain, in a written report, the abbot was taken by Vikings in 823 and he died of starvation in captivity. It’s interesting to me that the sweep of Orthodox Christianity sprang from Egypt, not the Roman Catholic Church. How did this odd connection happen? Most likely through trade of Irish tin into Egypt, but early pilgrimages to the Holy land were already established. Men have wandered in and out of Great Skellig since 1,400 B.C. when mythology mentions a shipwreck and drowning of a Celtic King. Look around. He’s supposed to be buried on the island. Long ago armies regrouped here before invading the mainland. But settlement didn’t occur until the self-sufficient monk’s arrival. Why did they choose to live on a harsh, towering rock? They sought isolation for meditation, prayer, and learning but there’s ancient mysticism in the shape of Egypt’s pyramids as well as this island’s form. Skellig Michael happens to be rich in stone for building materials and food (fish in the sea, seals, nesting birds or their eggs) but very poor in fresh water which led to an ingenious cistern and filtration system. The rectangular opening by the man’s feet is an opening to a cistern. There’s a hidden 9th century hermitage on the north peak that I’d love to see some day. Access isn’t allowed, although I did read that “arrangements” can be made to visit it. Today, we visit the south-facing peak. The monks discovered a microclimate here for growing crops and they kept goats for meat and milk. Behind the medieval church, there’s a cemetery with ancient burials and an eroded high cross. Inside the chapel there are two heartbreaking graves from 1871. The lighthouse keeper lost his two-year-old and four-year-old boys. He asked for removal from his post after his third child became sick. Through the eastern window, you can see the uninhabited bird sanctuary of Little Skellig. It is the largest protected breeding area of the northern gannet with over 30,000 pairs. Why was the monastery abandoned? There are many answers, such as Viking raids and increased storms from climate change which also brought colder weather and less rain. Without fresh water, the island failed to support life. The entire monastic order moved to Ballinskelligs hermitage in the 13th century. Great Skellig is 7.2 miles west of Portmagee in County Kerry on the Iveragh Peninsula. Only a handful of captains have permits for once a day landings to the UNESCO heritage site. Go to http://www.skelligexperience.com/ for a list of excursions from May-October. You must arrange your dates well in advance as seats sell out fast. If you’re lucky, you’ll get to meet Des Lavelle, our charming expert on all things Skellig and the author of The Skellig Story. Ask him to tell you the interesting story about how he discovered the island’s past and have him autograph his book which is sold in town gift shops. Des giving me a hug…because I’m from Montana and he has family connections in the US. 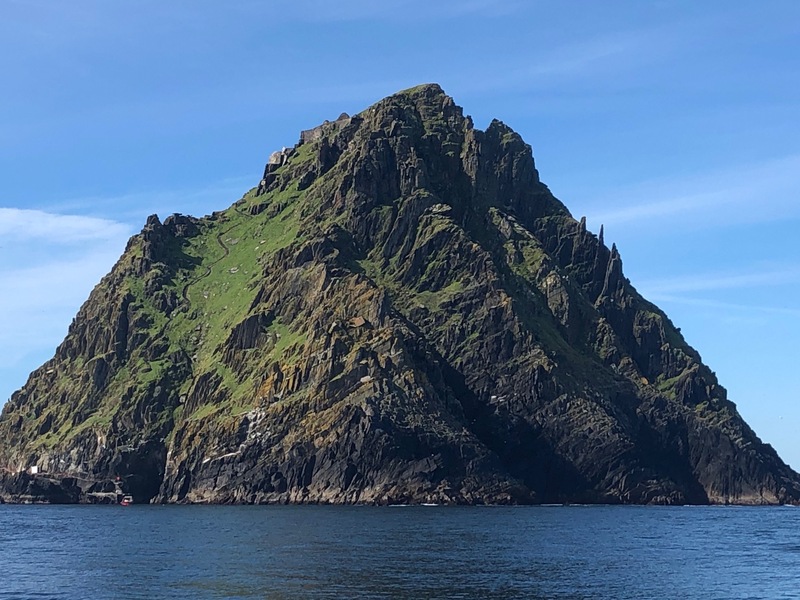 The Star Wars movies filmed here have made the island a place of pilgrimage and wonder once again. Before you disembark your boat, remember there are no facilities or services on the island. Bring hiking poles for more secure footing on the descent. first step down from the monastery is a big one! Take a deep breath and go for it. Blind Man’s Cove is where a modern dock accommodates tourists if the sea cooperates, which isn’t a sure thing. The other two sites are considered dangerous and date back to early settlement. Puffins, razorbills, petrels and gannets breed here so your journey up and down the stones will mean stopping to take dozens of photos. One can never have enough puffin pictures. Circling the island, grey seals rest on rocks or stick their heads out of the water to observe crazy humans in boats. The lighthouse seems to be perched too low and I wonder if waves pound the roof in winter. Dolphins race alongside the boat, cresting and diving in the wake and whales have been spotted. On the way back to Portmagee, our spiritual journey took another leap. A corona formed an irridescent circle around the sun. Closing my eyes, I sang my own psalm of praise and blessing. After a full day of exploration, we returned to beautiful Portmagee for a fine seafood meal and live music.